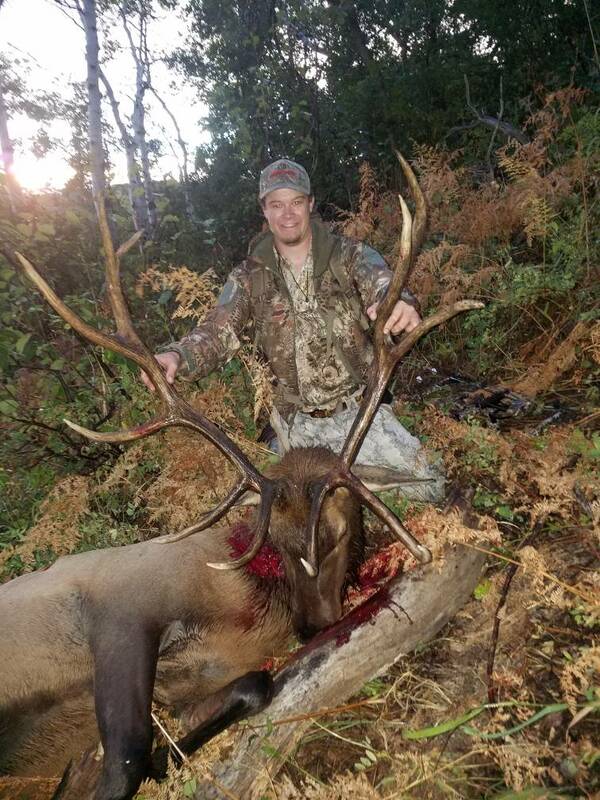 Opening day Archery Elk sucess! Well, the good Lord was lookin out for my pops and I. After putting in some work packing gear up on the hill for several days the Elk opener was finally upon us. Dad was too worn out to hunt first morning so I took a little venture, saw a bunch of sign but no elk. The evening hunt came and pops was rearin to go! We headed to a little wallow I have hunted for several years and not far from where I killed my bull last year. We got rained on for a good bit and decided to head back to camp after putting a trail Cam on the wallow. As soon as we topped out into the oak brush this joker skirted in front of us so I hit him with a little cow call (from my voice no reed) and tried to signal to dad to get his Bow sling off as I reallllly wanted him to sink an arrow in this bull, but just couldn't manage too get it off and an arrow knocked fast enough, so I had one knocked an at full draw as soon as he stepped out from behind the brush. 35yard shot and ten ringed um. Went 80yards with a blood trail a blind man could follow! Pops is up next! Fyi blood on neck was from his mouth/nose.. shot went in front shoulder and out behind 2nd rib. Heck yeah! Good luck to Pops! You got yours, now go get Pop's arrow bloody! That's the way to start the season!! Congrats and good luck to your Dad!!! Congrats on a nice bull and good luck to your pops! Very nice bull. I am heading that way Saturday, can’t wait. Yes sir son you put it on old Dad. Between shooting it in the evening we both knew it was going to be a long night and longer pack out. Not to mention it died on an extreme angle for your old crippled pops lol. It's all good son I'm glad I could be there with you to watch that arrow disappear and hear him crash 100 yards down hill. Was my pleasure to experience that with you. Worn out cut and battered we have some recoup time and back at it. Can we get one a little closer to the main trail next one? Love ya!!! 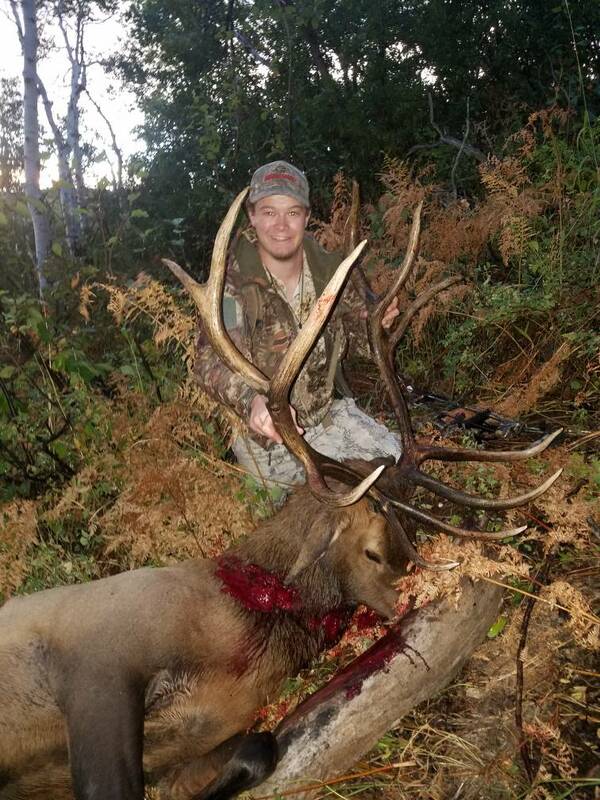 Congrats on connecting with a nice bull! That is awesome! Love the father son hunts. I'm going to hunt elk for the first time in 2019 and can't wait. Been hitting the gym and am 20 lbs down already! Congrats! Great to have your dad there, as well! Awesome hunt and unique bull. Love his big fronts! Awesome, all the way around. Heck yeah!!! Next batter up!! !